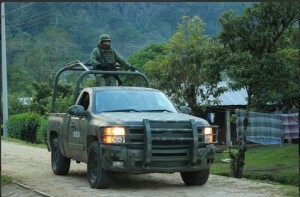 The Fray Bartolomé de Las Casas Human Rights Center (Frayba), has documented, through the Civilian Observation Brigades (BriCO), systematic incursions by the Mexican Army, who are harassing the Zapatista National Liberation Army (EZLN) bases of support, in the territory of the Good Government Council of La Realidad, Jungle-Border zone, Caracol I “Toward Hope” (JBG). The military actions in the territory of the JBG consist of incursions in convoys with trucks, hummers, jeeps, and motorized equipment; with members of the Mexican Army that range from 4 to 30 people. There are also low flights with light aircraft and helicopters photographing and filming members of the BriCO, zapatistas, and the JBG facilities. Since July 2014 these actions have been increasing, both in the size of the troops and the frequency with which they happen. (See the record of military activity at La Realidad). Frayba is concerned with the increasing harassment by the Mexican Army in zapatista territory, since it constitutes actions to provoke and besiege that harm the rights to autonomy and free determination stipulated in the Mexican Constitution, the United Nations Declaration on the Rights of Indigenous Peoples, the Convention 169 of the International Labor Organization (ILO), and the San Andrés Accords. Therefore, this Human Rights Center demands: Respect for the free determination and autonomy of zapatista peoples; and an end to the harassment by the federal government through the Mexican Army. Finally, we recall that on May 2, 2014, members of the Central Independiente de Obreros Agrícolas y Campesinos Histórica (CIOAC-H), ambushed zapatista bases of support in the territory of the JBG of La Realidad; durng the attack, the armed group murdered José Luis Solís López, “Maestro Galeano,” and destroyed the Autonomous Clinic and School. The aforementioned organization is part of the municipal government of Las Margaritas and has the protection of the state government of Manuel Velasco Coello, which has allowed it to carry out aggressions, forced displacements, and murders in the region.